In September of 2011 I attended SEALFIT’s world-renowned Kokoro Camp as a member of Class 19. At 46 years old, I prepared months in advance for this intense 50+ hour crucible training academy that mirrors the famous U.S. Navy SEAL BUD/S (Basic Underwater Demolition/SEAL) hellweek that has a failure rate of about 80%. The first-person account was chronicled in LA Sports & Fitness Magazine and also covered by NBC News. Physical preparation consisted of working out for eight weeks prior to camp an ostensibly insane 22-26 times per week, and consisted of running (hills, sand, lengthy distances, short incline intervals, with weighted vest), indoor cycling, boxing (heavy bag, sparring), circuit training (sledge hammers, tire flipping, box jumps, flutter kicks, battle ropes, barbell shot puts, sand shoveling), free weights, yoga, Murphs (slick), and Navy SEAL Pyramids (slick and weighted). Very few of these sessions lasted less than 50 minutes, and all took place while I worked in my full-time career for a corporate learning company. Release: Broadcast to the world what you intend to do by putting out a personal press release to friends and family about what you are setting out to accomplish. I did this by announcing my SEALFIT Kokoro attendance on Facebook to hundreds of people in my network. This exposed me, put me out there, and internally drove me to not just keep up my grueling training regimen pre-camp, but to not let up during Kokoro, lest I let others down. When shivering through numerous surf torture/hypothermia sessions laying in the 56 degree Pacific numerous times between midnight and dawn, locked arm-in-arm with my teammates, thoughts of quitting infiltrated mind, body and spirit. Many instances I literally thought of who, in addition to me, that I’d be disappointing if I quit. Accountability to many is often much more impactful than accountability to few, one, or self. Revisit: Go back in time and recapture a triumphant moment of overcoming a hardship with success. In my case, I looked at scrapbook photos to recall my final Golden Gloves training camp as a U.S. Amateur Boxer in 1997. To make the junior welterweight limit of 139 pounds, I dropped from 154 by undergoing an excruciating ten-weeks that consisted of a daily routine of 5 miles of running before work followed by a protein shake, lunch hour plyometrics followed by a protein shake plus fruit and an energy bar, two to three post-work hours of jumprope, heavy bag training, mittwork, sparring, and situps, and shadowboxing. Upon arriving home, 4 miles of running was followed by a dinner of soup, fruit, and water. In no uncertain terms this was not easy for two and half months, and calorie deprivation exacerbated the hardship. Little did I know that getting through this training camp, making weight, and reaching the finals match of the regional tournament until a (career-ending) injury forced me out, would establish a retrospective point to revisit. Repeat: View over and over what you intend to accomplish, or something close to it, to gain an absolute familiarity. YouTube is great for this purpose, and I viewed the Discovery Channel documentary of Navy SEAL Class 234 over and over and over. I watched all six hour-long episodes twice or three times each, becoming inculcated with everything from terminology to drills to evolutions to instructor tactics that would be inflicted upon me in Kokoro. While abstract knowledge is no substitute for tangible experience, visual preparation such as this saw to it that there were few surprises. Recruit: Gather a team of supporters. I asked for and got dozens of friends to be my virtual crew who’d send me positive thoughts all throughout Kokoro. Knowing that everyone has different daily routines, I specifically asked them all to close their eyes, think of me and whisper “just finish” each time they ate or drank or went to sleep during the weekend. I recalled this through several difficult moments in camp, and it either worked or acted as a placebo. At one point while rucking in formation with a heavy pack on a 20+ mile steep mountain ascent in pre-dawn hours, I actually imagined the face and heard the laugh of a friend who is a prolific late night carouser, thinking I bet she’s taking a shot right now and toasting me. One way or another, having a virtual armada surrounding me from afar with good vibes helped. Relate: Everything is relative, so find something harder than you’re setting out to do, then read about it or watch it or think about it. Then repeat it again. I watched two infamous scenes of The Passion of the Christ over and over for nearly two hours the night before Kokoro, which illustrated much more suffering than I’d ever go through. I vividly recalled these horrific scenes while rucking up the steep mountain ascent. Dehydration, vomiting, cramps, exhaustion and doubt were all present on this brutal uphill evolution, but as bad as I felt I thought to myself that at least I wasn’t carrying a heavy cross with a thorn of crowns nailed into my head and hadn’t been whipped and beaten for hours beforehand. Regardless of how bad you have it, someone has survived worse. Record: Memorize something that you say over and over and over that resonates, inspires and motivates you. I studied the poem Invictus (“unconquerable” in Latin) prior to camp, and said it during surf torture as a means of distraction for my body and mind from the wet and cold ocean. It even saved me and my teammates once during a middle-of-the-night beach evolution when I volunteered and recited the poem to perfection for the instructors, thus saving the team from yet another “get wet and sandy” order that is a staple of SEAL hellweek. Reason: Finally, find a profound and substantive reason for doing what you’re doing. Sometimes this is known in advance. A past SEALFIT Kokoro graduate told me that one thing that kept him alive during his camp was experiencing his daughter’s joy when he returned home with stories and a graduation certificate of his experience. Had he quit, he would not have been able to have this moment. And in many cases, as in mine, the reason is opaque and not yet quite crystallized. I thought that I wanted to complete Kokoro at my advanced age to test myself, to meet myself along the way, to see what I was made of, to see what I wasn’t made of, and to illustrate that capability exceeds belief. These things were all very true, but I later found out that another significant reason was to inspire others to lean into discomfort, to face uncertainty, and to aspire. 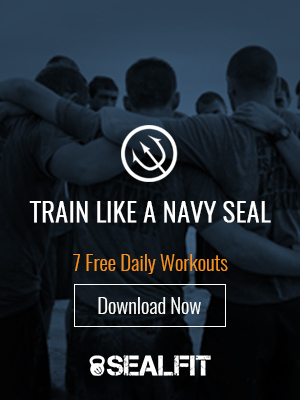 When I was interviewed during the application process by Mark Divine, former Navy SEAL Team 3 Commander, trainer/mentor to thousands of Navy SEAL and Special Ops candidates, and founder of SEALFIT’s Kokoro Camp, he described Kokoro and Navy SEAL hellweek training as that in which “most people are broken within the first 6-8 hours physically. Whether you go on from there is about your heart, mind and spirit.” I now realize that it’s not just about the youngest, fastest, strongest or most genetically-gifted individual. Such elements matter, and I’ll certainly take them, but the intangibles…things that can’t necessarily be measured or seen…count a great deal. It’s this lesson that I learned with crystal clarity during and after Kokoro 19 at the SEALFIT Academy in Encinitas, CA. Without the symbiotic relationship of the physical and the mental, imbalance is likely to exist. Optimizing both gives you the best shot at marrying the physicality of training to the mindset of steadfast resolve, and this powerful combination can take anyone to absolutely any finish line. -Patrick Barry is a corporate learning software executive from Los Angeles, CA, is unlikely to ever go on a log ride at a water-themed amusement park for the rest of his life, and can be reached at [email protected] . His adventure was also chronicled by SEALFIT in this cool trailer: http://www.youtube.com/watch?v=eb9SNXM6yDE .